One of the most challenging tasks for a Citrix administrator is when a user calls in complaining of a Citrix problem: logon is slow, session is getting disconnected, application launch is slow, session itself is slow, etc. So, how does a Citrix admin go about solving these issues? A Citrix infrastructure has many tiers and dependencies. Where to start looking, what to analyze, and how to triage? 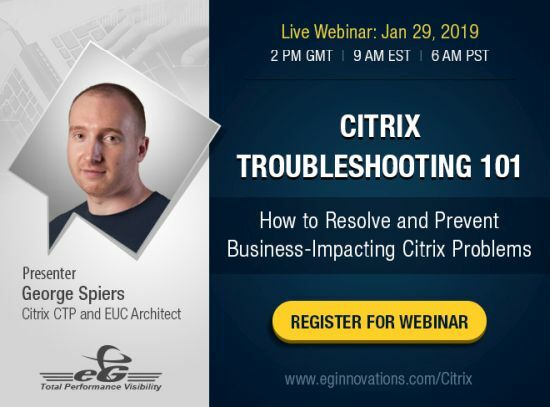 Join this webinar by George Spiers, Citrix CTP and EUC Architect, who shares his real-world experience to help you learn the art of Citrix troubleshooting. Troubleshoot common Citrix problems such as slow logons, slow app/desktop launch, disconnecting sessions, frozen sessions, etc. At the end, they will also talk about how automated monitoring can help accelerate performance troubleshooting. Register now and save your seat!